If you’re planning to transfer homes in a matter of weeks, it will be necessary for you to be well- equipped during your moving process. Most times, there are tips which movers wished their clients knew. This should make the entire transferring activity much more efficient. Whenever possible, it would also be helpful to you to check out phone apps so you would be guided on your checklists in preparation for a possibly arduous activity. Be sure to speak with a moving company which thoroughly caters to your requirements and specifications. There are transferring groups which have been in the business, and have proven their competency throughout Chicago. All it takes is to be wise enough to choose the mover who can completely meet your needs. To ensure a much more efficient transferring activity, you must plot your packing schedule ahead of time. All your boxes needs to be neatly taped over and organized. Always make an effort to coordinate with your mover, so you will know and prepare for the next steps which will be taken for the success of your project. We quizzed some movers on their biggest pet peeves when it comes time for moving day. Here are seven things you need to know. Every company is going to put its best face forward during the estimate process, but when it comes to finding out which companies will move your stuff and make you feel comfortable in the process, Steed recommends stopping by the office. In person. Before you get out the bubble wrap, figure out what needs to happen for the day to go smoothly. Do you need to reserve your building’s elevator? Will the truck be parking on a busy street? If so, save a spot ahead of time. If you’re moving in or out of an apartment complex, make sure you know the rules—designated moving hours can cause major complications. If you’ve elected to do your own packing, make sure it’s finished. That doesn’t mean boxes untaped and scattered throughout the house. That means boxes filled, taped up, and ready to go by the time your movers show up. Ideally, everything will be located in a central room, which speeds up the process and keeps your possessions safe. You don’t need to write down the specific contents of every box, but noting where in your new home it should go is essential. “It’s easier if the movers know where to put it as opposed to trying to delineate where it goes on move day, when we’re charging our hourly rate,” Steed says. Try as they might, movers aren’t psychics. They don’t know that the blue vase cost you $2,500, or that your grandma gave you that crystal decanter, or the retail value of your crushed velvet couch. Let them know beforehand what items they should keep a careful eye on. 6. Get out of the way! Not only can an eager homeowner slow down efforts, but he or she can also be an insurance liability. Yes, you need to tip your movers—between $20 and $50 is standard, according to Steed, but more is always welcome. Aside from ensuring you’ll work and coordinate well with movers for the benefit of your move, you may also consider an app which can update you throughout the transfer. There are free apps which can serve as your guide throughout the moving process. The truth is that residential moves are not meant to be handled without any help, that this is why most people about to move to another home in another city are always looking for good ways to relieve the building stress and force organized structure into the chaos. Yes, any type of competent and timely relocation assistance is always welcome, but what’s the best /understand easiest and cheapest/ way to get it? Luckily, the Digital Age gives us convenient ways to organize a move from start to finish directly from a mobile device. And even more luckily, some of these digital relocation assistants are an excellent choice whenever one of the most transitional periods in life knocks on our doors. 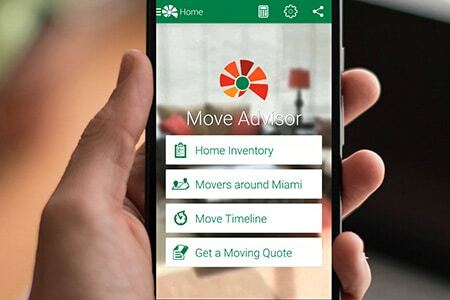 Meet Move Advisor – a revolutionary moving organization app that truly redefines the way a house move is organized and executed. Move Advisor is equipped with an advanced week-by-week moving timeline checklist that enlists all of the essential moving tasks you must complete before, during and after the relocation. To simplify things as much as possible, Moving Timeline actually customizes your chores depending on the exact date of the move and won’t overwhelm you by suggesting more jobs than you can handle effectively. All your moving tasks are displayed with the help of eye-catching large icons, and although the graphical representations of your work are entirely self-explanatory, you just need to tap a particular icon to read more relevant information about the selected task. The best thing about the moving calendar tool is that it’s so much more than just a detailed to-do list. In reality, it gives you full control over the entire preparation process in terms of work to be done. With Move Advisor installed and running on your preferred mobile device, you are now the sole manager of your tasks – mark them as complete, delete them if you view them as inapplicable in your case, or set quick reminders to take care of them later. What’s more, the moving planner checklist makes it even easier for you and lets you save time by introducing an ACTION button underneath particular tasks. Tap that button and get practical suggestions on how you can complete the job at hand more quickly than ever. Additionally, Move Advisor offers a home inventory tool which will not only turn the tedious process of inventorying your entire household into a piece of cake, but it will also let you have fun while doing it. Creating an exact digital copy of your home and all the household items in it has never been easier! Build and name virtual rooms in seconds, and start filling them with all the possessions found inside the corresponding real-life walled living spaces. Quick drag-n-drop actions will let you enjoy the inventory-making process, and when you’re ready with one room, you just move on to the next one. Sometimes timely professional assistance when moving house can well be the thin line between a highly successful move and a failed relocation attempt with disastrous consequences. With Move Advisor on your device, the hunt for the best cross country movers is swiftly taken to the next level. A few taps is all you need to pinpoint the location of properly licensed and adequately insured moving companies near your home. Mover Around You gives you a comprehensive list of reliable professional movers, together with their current contact information so that you can get in touch with them in seconds. Achieve moving success by being thoroughly updated with your movers, and checking out some apps to guide you throughout the transfer. It’s important to ensure you’re in good hands by choosing the right moving company to fit your requirements. Wolley Movers is a Chicago-based company which has served their clients in the residential, commercial and industrial fields. Their friendly and thorough movers can provide local and long-distance services, no matter how small or large scale a project may be. To learn more about our moving services, click here!